Great read here by Associated Press national writer Paul Newberry (one of my favorites) on Michael Phelps sober journey as he heads toward the U.S. Olympic Trials and the Olympics in Rio a year from now. Michael Phelps is still focused on going fast in the pool. Outside the water, he’s made some big changes. The winningest athlete in Olympic history will be competing this week at the U.S. championships in San Antonio — basically, a backup meet for all those American swimmers who didn’t qualify for the world championships in Kazan, Russia. Actually, Phelps did claim a spot on the team. But, after his second drunken driving arrest last September, USA Swimming issued a six-month suspension and took away his trip to Russia. There were other things he needed to do, as well. 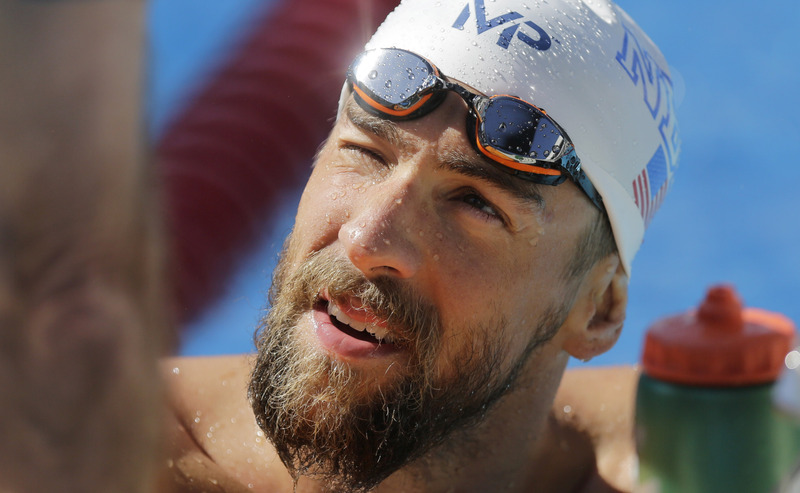 Phelps underwent 45 days of inpatient treatment, enrolled in Alcoholics Anonymous, and decided that he needed to get drinking out of his life, at least in the short term. Phelps, who has won 18 golds and 22 medals overall at the last three Olympics, retired from swimming after the 2012 London Games, saying he had no goals left to accomplish and didn’t want to still be competing into his 30s. That decision lasted barely a year. By the following summer, he was itching to race again. Now, after enduring another bump in his personal life, he’s determined to end his swimming career on a high note. That means staying clean and sober. “If I’m going to come back, I need to do this the right way,” Phelps said. “I’ve got to put my body in the best physical shape I can possibly get it in. Is it a challenge? No. I go to bed earlier. I sleep more. I wake up every day and have a completely clear head. I don’t feel like my head went through a brick wall. There are so many positives to it. Phelps is eager to see what kind of times he can post in San Antonio, saying he “has not been in this kind of shape in a long, long time. Maybe not ever.” He’s scheduled to swim four events: the 100- and 200-meter butterfly, the 200 individual medley, and the 200 breaststroke. The breaststroke is simply a workout, something to do on the final day of the meet Monday. But those other three are his best events, the ones he’s clearly eyeing for the Rio Olympics. While Phelps figures to be the class of the field in San Antonio, he’ll be eager to compare his times to the ones being put up in Kazan, where the eight-day swimming competition began Sunday. Phelps won’t be the only Olympic gold medalist in San Antonio. Training partner Allison Schmitt, one of the biggest stars of the 2012 London Games, failed to qualify for the last two world championships and finally went public this year with her battle against depression. She hopes the nationals will show that her life and swimming career are back on track with the Rio Games just a year away. Cullen Jones, a four-time Olympic medalist, will also be at nationals, along with Dana Vollmer, who has four Olympic golds and recently returned to competition after the birth of her first child. But all eyes will be on Phelps, who seems to have taken his life in a different direction away from the pool. He’s engaged to be married, celebrated his 30th birthday at the end of June, and has thrown himself fully into training for what he said will surely be his final Olympics. Phelps said therapy helped him uncover and address some of the issues weighing down his seemingly perfect life. USA Swimming announced Thursday it will hold its domestic training camp in San Antonio, Texas, July 13-21, 2016 at the Northside Swim Center. It’s also the site of the 2015 National Championships. The international training camp will be in San Juan, Puerto Rico. SAN ANTONIO – USA Swimming announced today that it will hold the domestic training camp for the 2016 U.S. Olympic Swimming Team in San Antonio at the state-of-the-art Northside Swim Center from July 13-21, 2016. Following the 2016 U.S. Olympic Team Trials – Swimming in Omaha, Nebraska, athletes who qualify to represent Team USA at the 2016 Olympic Games in Rio de Janeiro, Brazil, will gather in San Antonio and train at the Northside Swim Center, site of the 2015 USA Swimming Phillips 66 National Championships, to begin preparations for the Games. During the camp, area swimmers and sports fans will have the opportunity to meet the 2016 U.S. Olympic Swimming Team, as one practice will be open to spectators, followed by an autograph session. The timing and details of the open practice and autograph session will be announced next summer prior to the start of the camp. Completed in July 2013, the Northside Swim Center features a 50-meter, Olympic-size outdoor pool and 25-meter diving and warm-up pool. The outdoor swim center features shaded seating for 2,400 spectators, as well as high-tech timing, lighting, sound and video scoreboard systems. Locker room facilities can accommodate as many as 1,200 athletes. The facility also will host a quartet of high-level meets in 2015: USA Swimming’s Phillips 66 National Championships (Aug. 6-10) and Speedo Junior National Championships (July 30-Aug. 3), as well as the U.S. Masters Swimming Spring National Championships (April 23-26) and World Deaf Swimming Championships (Aug. 17-22). Bremerton’s Nathan Adrian successfully defended his 50-yard freestyle title on Thursday at the Winter Nationals in Greensboro, North Carolina. Adrian, the American record-holder in the event in 18.66 seconds, touched the wall in 18.81 — a course record — to beat Simonas Bilis in 19.28. Eric McGinnis was third in 19.37. It was Adrian’s fifth fastest-time ever. Adrian will also swim in the 100 free on Saturday, an event he also won last year. Gold medalists Nathan Adrian and Katie Ledecky will compete at USA Swimming’s winter nationals at the Greensboro Aquatic Center in North Carolina next week. More than 800 swimmers are expected to participate in the meet, Dec. 3-6. Prelims are at 6 a.m. Pacific with finals at 2 p.m. Also expected to join Adrian and Ledecky are Andrew Gemmell, Connor Jaeger, Cullen Jones and Micah Lawrence. 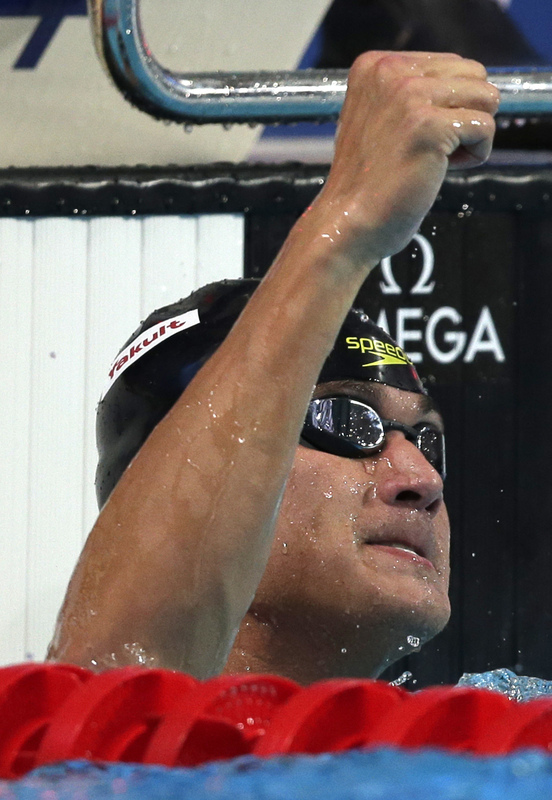 Adrian holds the American record in the 50 and 100-yard freestyle events. He is coming off a Golden Goggles appearance where he was nominated along with his teammates for relay performance of the year in the 400 medley relay from the Pan Pacific Championships. Ledecky won three Golden Goggles Monday in New York. A live webcast of the meet can be found at usaswimming.org. Also, here’s extra footage from Nathan at the Arena Grand Prix in Minneapolis where he talks about his 200 free race strategy. And, how he felt about his 50 free time.